You don’t always need to spend a fortune to get a drum sound and with a few simple ‘drum hacks’ you’ll learn how to make your drum kit sound better than it ever has before. The importance of tuning your drum kit and having a brand new set of heads on. When you should use ‘dampening’ to improve your drum sound. Why you should invest in good cymbals. What a ‘kick port’ is. These are the best ways to make a cheap drum kit sound good. An obvious place to start, maybe, but your drumheads are the key to making your kit sound great no matter what state it’s in. Once you’ve got your old battered drumheads off your next problem is deciding out of the countless options what to replace them with. It’ll take trial and error at first to focus in on what you want from a drumhead, but if in doubt look towards classics such as the Remo Pinstripe, or the Evans Genera Dry to rescue even the direst of drums. 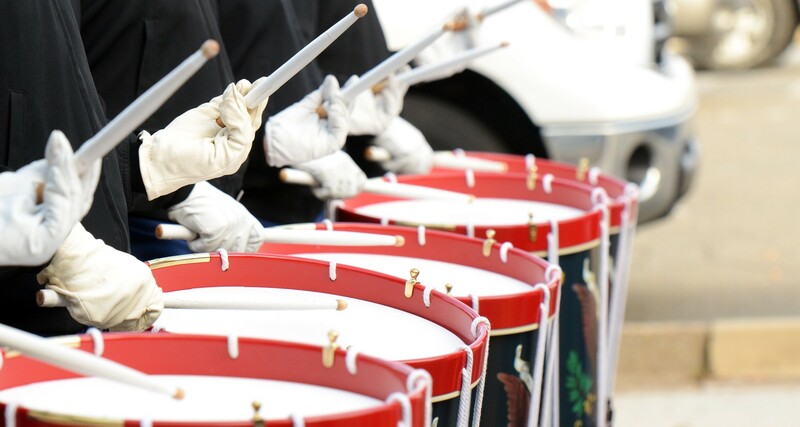 Tuning drums by ear can be a tedious and time-consuming task, especially for the inexperienced. Yet spending quality time with your drums will not only pay off short term in a great sounding kit, but you will also hone the skills to make tuning in future faster, more efficient, and more accurate. To get you started there are many videos on YouTube with expert explanations on the subject. If you’ve run out of patience, or just need a little help getting your drums to really sing, then a drum tuner would be a wise investment. Whether it be the old school, analogue Drumdial; or the futuristic, digital TuneBot, drum tuners are endlessly useful if you’re having trouble picking your way through a wall of overtones. They can even improve your ear by challenging or qualifying what you’re hearing. Eventually though you will have to use your ears to be sure that what the tuner is telling actually translates to a great sounding drum. Any nasty overtones that tuning couldn’t deal with – particularly problematic with cheaper drums – can easily be dealt with through a bit of smart dampening. Moon Gel is the king of all dampening, and although a little pricey, the improvement it can make to some drums borders on witchcraft. But if we’re on a budget a bit of duct tape can be an easy and versatile alternative, or failing that, just place your wallet at the edge of the head for an instant crisp, dry drum sound. Easily overlooked, but good snare wires can turn your snare sound around. More wires means more sensitivity and different metal compositions can make the sound more snappy and crisp, or softer and more sensitive. Plus good wires can help to reduce snare buzz, will be kinder to the snare’s incredibly thin resonant head, and be much more durable. The Kick Port is a bass port for you kick drum that sits inside the sound-hole of the resonant head. It accentuates the kick’s low end making it punchier than ever before and turning even the weediest of bass drums into a canon! It also acts as an extremely durable sound-hole reinforcement so that not even the clumsiest of sound engineers could tear your drumhead. A great sounding set of cymbals can be the make or break of a drum kit but they needn’t break the bank. Take Stagg’s range of dual hammered cymbals for example. They sound great and can hold their own against the big competition form Zildjian, Sabian, and Paiste, yet and a fraction of the price. It’s worth remembering it’s much more difficult to quick-fix a cymbal to sound any better than the day it was bought, but sub par cymbals can come in handy for creating stackers or otherwise experimenting with sounds. Once you’ve got your kit sounding better than ever keep it that way. Regular TLC, whether it be tuning, cleaning, oiling hardware or changing heads before they’re completely ruined will go a long, long way. I’ve done too many gigs where I’ve been greeted by a house drum kit identical to my own, yet one that is borderline unplayable due to neglect and mistreatment. It’s sad because I know how good the kit can sound; it’s annoying because I still have to cart along my own drums; and it’s a shame that the drums will become useless long before their time. Don’t let your kit see the same fate.